Welcome Smart Developers & Thinkers! Join us at elektro:camp(«2012.10») on 26+27 October 2012 at the Faculty of Engineering, University of Leuven in Belgium! 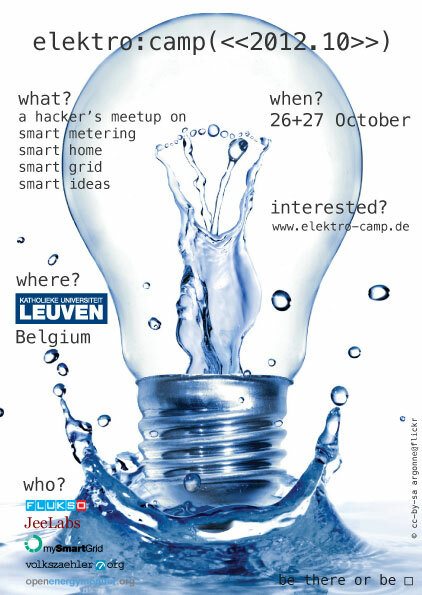 Elektro:Camp is a participative workshop on Smart Metering, Smart Home, Smart Grid and Smart Ideas, in a BarCamp style. This is the fifth meeting of the open source metering community. The concept worked very well at the previous meetings in Kaiserslautern (October 2010), Stuttgart (May 2011), Groningen (November 2011) and Offenburg (May 2012). You're thinking of participating for the first time? To get an impression of the previous elektro:camp you might want to take a closer look at the proceedings. Feel free to use the artwork to promote EC1210 on your site or in dead-tree format. Set your GPS destination to latitude=50.8582 and longitude=4.6651. Hit the brakes in time or you'll drive straight into the river. You'll find a parking lot some 50m to the right. What to expect from the Elektro:Camp? The elektro:camp is a BarCamp style conference. They elektro:camp is an open, participatory workshop-event, the content of which is provided by participants. Placeholder for copy of presentation slides.